PUMPKINS DROP AT NORTH SHORE HIGH SCHOOL ON HALLOWEEN! North Shore Schools, Glen Head, NY - On Halloween 2016, students in North Shore High School Regents Physics’ classes as well as students in the conceptual physics course held The Great Pumpkin Drop testing the principle that all falling objects accelerate at the same rate. Ms. Sara LeMar said, “My juniors and seniors study the laws of motion as well as force interactions. While most think that physics is equations and calculations, we encourage students to observe interactions occurring in their everyday life.” The Pumpkin Drop experiment helps students to appreciate that acceleration due to the earth’s gravitational field, is the same for all objects, regardless of their mass. 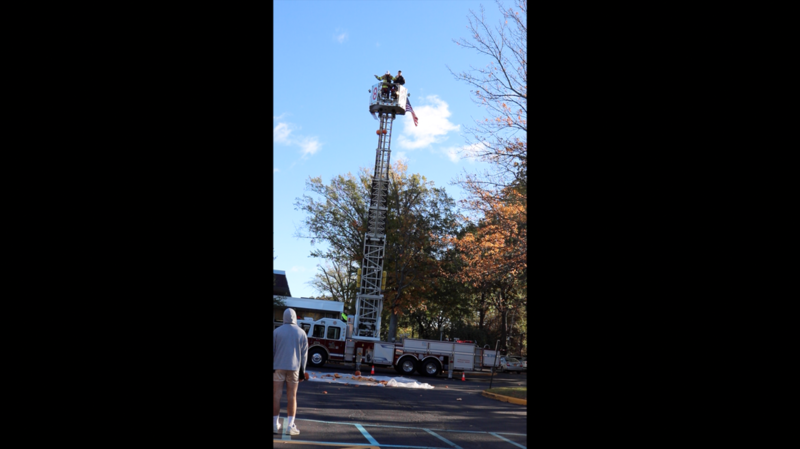 Several members of the Glenwood Landing Fire Department with their large ladder truck came to North Shore High School to help Ms. LeMar with this dramatic experiment. Additionally, the Rottkamp family generously donated 15 pumpkins from The Rottkamp Brothers Farm in Old Brookville for use in this demonstration. The pumpkins were brought to a height of approximately 40 feet, and were dropped simultaneously in pairs. With help from Mr. Rich Galati, a former North Shore High School Physics teacher, students were able to observe whether different masses falling from a much higher distance would hit the ground at the same time. Ms. LeMar said, “My students timed the drops and took slow motion videos of the drops for analysis of the rate at which the objects fell. While we had previously discussed the motion of objects in free fall, this demonstration opened up opportunity for students to discuss drag and air resistance that act when objects fall as well as the forces acting on an object when it is in free fall.” While some audience members concluded that the larger pumpkin would hit the ground first, the students witnessed that both pumpkins hit the ground at the same time! Regardless of the size differential, the pumpkins proved the point that the ratio of the force of gravity to the mass of an object is a constant with regard to acceleration due to gravity. Ms. LeMar concluded by saying, “Looking forward, we will tie in our observations and results of the Pumpkin Drop demonstration when we study the impact and change in momentum of objects.” Thanks to all the science teachers, staff, and community members for making this fun and timely science experiment possible.